Washington (CNN) – Vice President Joe Biden is currently in Wilmington, Delaware prepping for the vice presidential debate Thursday. However, the Obama campaign does not expect Biden, a former senator and chairman of the Senate Foreign Relations Committee, to make up for the president's showing in the first presidential debate, according to multiple Democratic sources. While Obama campaign senior adviser David Axelrod is on hand in Delaware, sources told CNN his presence is not a reaction to the president's weak showing at the Denver debate and that Axelrod was previously scheduled to attend. The vice president's preparations are being run by his former chief of staff Ron Klain, who is in charge of the president's prep as well. 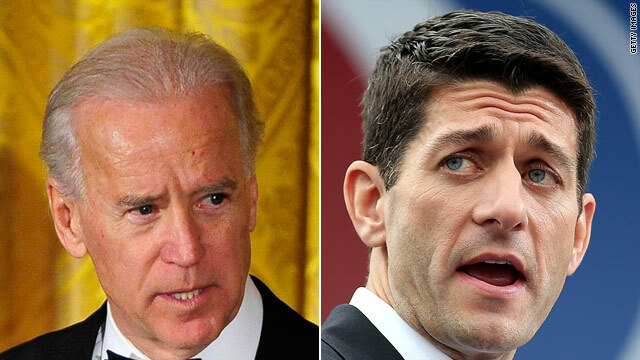 Ok, since Biden's only argument is to call Ryan a liar or accuse him and Romney of flip flopping, he should pretty much wrap up debate prep in time to go say something extremely embarrassing for the 5 o'clock news. Unless he's a really slow study. Ya, perhaps he'll need the next couple of days after all. Obama and the obama stooges are obviously DESPERATE. They are resorting to wild accusations ... character assassination ... smear tactics ... and feverishly raising money ... in a desperate attempt to win at ANY cost. In addition, stories are beginning to emerge, about online obama fund raising scandals, and unnamed foreign contributors. It is really impressing how narrow minded some people are. Obama obviously is not the "super hero president" everybody expected him to be, so almost everybody is disappointed about his efforts. But voting for Mitt Romney? Seriously? If the American people really decide to vote for him as the next president, they show the world how stupid they are. Romney promises to lower taxes for everyone while increasing the military budget and keeping benefits for senior citizens, keeping the main concepts of Obamacare and giving some extra cuts for "job creators". At the same time he wants to lower the deficit. But Romney and Ryan did not outline ANY solid plan HOW to finance what they want to do. The only thing they are repeatedly mentioning is "closing some tax loopholes" and cutting some subsidies. Either they don't want to tell the American people what the really want to do, or they don't have any plan and are just lying. Either way, they are constantly lying about various subjects (as mentioned in this and other CNN articles) but nobody seems to care! I don't really get it, how you could vote for somebody who is lying to your face so effortlessly. you and Howard are both slugs. If you have a bit of brain you will regret what you have said. Ryan is no body. He may love video game, he is too immature when it comes to managing this country. If he dares to compare himself to Binden, he asks for self destruction, as for insult to himself. TO ALL YOU OBAMA STOOGES ... like 2020 ... Your blind devotion to 'Dear Leader' ... your Fuhrer, is touching ... but it's time for you to leave the Obama cult. Defending Obama, who lost the debate, and who can't loose like a good sport, just makes you ALL look like sore loosers. Obama was given a chance ... and, in the past 4 years, he has nearly destroyed America. NOW, it's time for Barack and Michelle to abdicate their throne, so Mitt Romney can begin repairing the excessive damage caused by Obama's terrible policies. Good bye Barack, Michelle, Nancy, Harry, Jarret, and Axelrod, and all the unelected czars ... and, GOOD RIDDANCE TO YOU ALL ... I'm sure you all will find another way to pick the pockets of hard working Americans !!! Biden attended the University of Delaware in Newark, where he was more interested in sports and socializing than in studying, although his classmates were impressed by his cramming abilities.... ...He double majored in history and political science and graduated with a Bachelor of Arts in 1965, ranking 506th of 688 in his class. He went on to receive his Juris Doctor from Syracuse University's College of Law in 1968, where by his own description he found it to be "the biggest bore in the world" and pulled many all-nighters to get by. During his first year there, he was accused of having plagiarized 5 of 15 pages of a law review article. Biden said it was inadvertent due to his not knowing the proper rules of citation, and he was permitted to retake the course after receiving a grade of F, which was subsequently dropped from his record. He was admitted to the Delaware Bar in 1969. Hey 2020, so let's just let the idiots who have not even had a budget, and spent 6 trillion dollars keep piloting the USS Titanic!!! That prescriptions will doom us all. There has been no attempt at any fiscal restraint. IS IT INTENTIONAL?!?!?! It is irrelevant how much Romney pays in taxes, if Michelle has an organic garden, BO sings Al Green, abortion, or the gay's rights. The economy and foreign affairs are the only things that matter, and so far BO has spent his time spending money to artificially prop up the economy for an even greater fall. Why would he pay TRILLIONS to Goldman Sachs and friends, and stay in the wars? Because they are expensive, and he is trying to bankrupt us. Is there another answer? have you been sleeping 2020? You dont make sense....it is biden who dont make sense...everytime he opens his mouth he sticks a foot in. Good thing he got there early so he could get use to the altitude! Wouldn't want elevation to be an issue like it was last week between O and Romney. Poor old Joe is lightheaded enough. In an explosive report set to send shockwaves through official Washington, the Government Accountability Institute (GAI) released a 108-page GAI investigation into the threat of foreign and fraudulent Internet campaign donations in U.S. federal elections. Visit campaignfundingrisks.com to download the full report. The unusual Obama.com website redirects traffic directly to a donation page on the Obama campaign’s official website, my.barackobama.com, which does not require donors tob enter their credit card security code, thereby increasing the likelihood of foreign or fraudulent donations. The website is managed by a small web development firm, Wicked Global, in Maine. One of Wicked Global’s employees, Greg Dorr, lists on his LinkedIn page his additional employment with Peace Action Maine and Maine Voices for Palestinian Rights. According to the GAI report, 68 percent of all Internet traffic to Obama.com comes from foreign visitors. In addition to the Obama.com redirect revelation, the Government Accountability Institute report exposes myriad gaping online security holes that stand to threaten the integrity of House, Senate, and presidential elections. oh...my, and to think this idiot could become president if BO strokes out or something...come to think of it...well, never mind. leukevent, You left out the part were Gov. Romney said that he would also close the loopholes for the rich. Why does Obama feels the need to lie to his followers? Obammy says we have a dead ambassador because of a movie??? come on dude Obummer has been lying and saying anything convienant for 4 years, at least Mr. Romney isnt a sissy like oblameo, i mean geeez giving a speech over dead American corpses that is so low on the class scale. SIX days to train gaffy Joe to not to stick his feet in his. Outh. Not nearly enough. Hey Joe, tell me the DMC isn't spending more monies than they take in. Why that would be irresponsible! Just like the current administration, isn't it?